JUCHEREAU DES CHATELETS, NOËL, Bachelor of Laws, member of the Compagnie des Cent-Associés, and head clerk of the Communauté des Habitants; brother of Jean Juchereau de Maur; baptized 30 Aug. 1593 at Tourouvre (Orne, France), son of Jean Juchereau and Jeanne Creste; d. 1648, unmarried, at Orléans (France). Noël Juchereau received an excellent education: he completed a course in the humanities, followed by a course in law. A member of the Cent-Associés, he came to New France in 1634 (or 1632), probably as representative of the syndicate of eight members set up to administer the company after the disaster which befell Roquemont’s fleet in 1628. 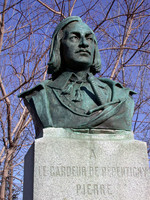 Juchereau was a prominent figure at Quebec: he received grants of land and took an active part in the life of the colony. The governor sought his assistance frequently when certain delicate legal matters had to be decided. It was he, who, together with Pierre Legardeur de Repentigny, conceived in 1644 the idea of the Communauté des Habitants, of which he was appointed head clerk in 1645. Henceforth Juchereau was very much to the fore in the colony; as a churchwarden in 1645–46, he had a part in all religious ceremonies, which were the essence of Quebec’s social life at this period. The Journal des Jésuites refers to his carrying the canopy, distributing consecrated bread, or washing the feet of Indians on Maundy Thursday. All, however, was not well at Quebec and in the Communauté. A reorganization of the colonial administration was needed. As a result several memoranda were addressed to the king in 1647, requesting the elimination of various abuses. Des Chatelets himself sailed for France in October, in order to lay the colony’s problems before the king. These efforts were subsequently to lead to the royal regulations of 1648. But Juchereau did not live to see them implemented, for he died on this trip, in the city of Orléans, shortly before 31 July 1648. Arch. Départementales de l’Orne (Alençon, France), “État civil (1552–1902),” Tourouvre, 30 août 1593: archives.orne.fr/consultez/consultez2.html (consulted 24 Oct. 2012). André Vachon, “JUCHEREAU DES CHATELETS, NOËL,” in Dictionary of Canadian Biography, vol. 1, University of Toronto/Université Laval, 2003–, accessed April 26, 2019, http://www.biographi.ca/en/bio/juchereau_des_chatelets_noel_1E.html.